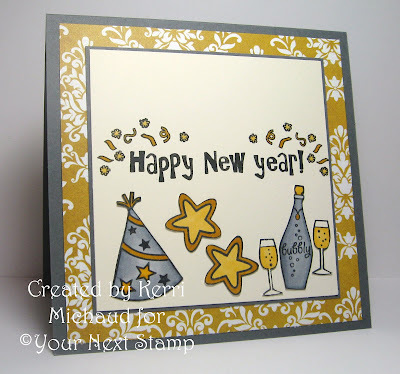 Your Next Stamp Blog Hop!!! 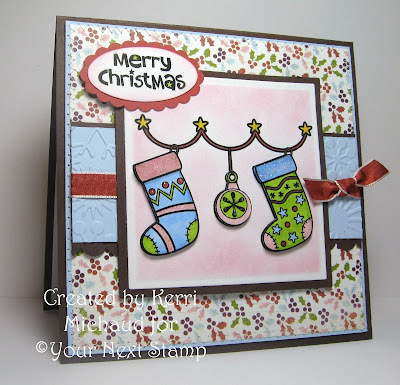 This card uses the Christmas Stockings with Merry Christmas bundle which is currently 20% off!!! In fact, all of the digital images are 20% off! I used dp from the Basic Grey Eskimo Kisses Paper Pad. I used Skating Ellie for this card. I printed her out twice and cut out her hat so I could pop it up on Dimensionals. The dp is My Mind's Eye Be Merry. I used this week's Sketch Saturday sketch for my layout. 1) Leave a comment on each of the Starlets blogs, and Karen's for a chance to win one of the newly released Fhiona sets. There will be 3 winners! 2) I will choose a random commenter on this post to win 2 of the Limited Edition Christmas Digital Images! 3) Karen is offering 10% off your order this week~just use the code YNSBH2. She will also include a suprise gift with every order! 4) We need a name for Fhiona's Beau! Leave your suggestion on Karen's Blog and get an extra entry into the Wedding Fhiona giveaway! Lovely colors you did on both the card and image for the first one. The two Christmas digis and their DP are perfect for the winter seasons. All are awesome creations! All of them are really cool Kerri! That Fhiona is just adorable! LOVE those DP's! Your stocking card is just too cute, again...great papers and coloring! And Skating Ellie is very sweet, love her layers, papers and ribbon/bow! You always use the neatest papers girl! Gorgeous cards! This Fhiona is so cute! Love how you layered Skating Ellie on your card! kerri...these are so fun! love your sketch card, and those colors are just wonderful! Beautiful cards, love those images. These are adorable! I'm off to check out what else they offer. CUTE CUTE CUTE!! I love all those patterned papers- they fit perfectly! These are all so beautiful Kerri!! I love your choice of papers and your coloring!! You sure have been busy!! Fhiona is adorable as is Elli!! Great use of the sketches!! Kerri, these are gorgeous!Love your paper piecing of Skating Ellie and the coloring of Fhiona is out of this world! Love them all! Fabulous creations Kerri! Your Party Fhiona card colors are so elegant - just lovely. I just adore your Christmas cards too - your dp is too cute!!! I love them all!!! How cute! I like the DP you used and your coloring for the New Years Fhiona. these images are so cute. I love what you have done with them. What a lovely cards Kerri, so cute and wonderfyul! Your cards are stunning Kerri! 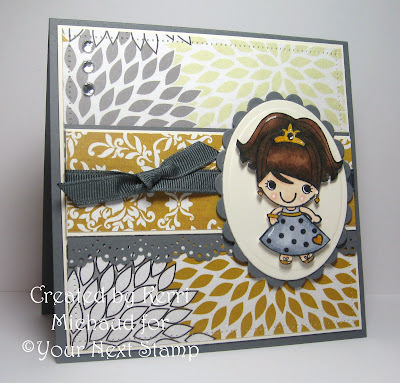 I love the patterned papers that you used on them! Great job! Love the party card it is gorgeous, these new stamps look so cute!! Wow your cards are so creative and inspiring. I just love your creative style. Lovely cards! You did a fabulous job with these images...and your choice of papers is great! All totally fabulous! Love how you did the party on the inside of the first one and the coloring and papers on all of them are perfect! Love the skater although not quite ready for it being that cold. These little gals are really cute! Love the colours you used for the Happy New Year's Fhiona! Wow! I love that skating image! super cute projects! These are so fun! You have been busy! they are so so so very cute, great cards, i especiall like skating ellie. Looks like I missed so much fun... All of the cards are so adorable! Love the colors of the first one! The inside looks great! Really like the cute line-up of the second card!And simply adore Skating Ellie! I love the little girl's hat popped up! That looks awesome. And the hanging stockings are great. Your coloring is fantastic! Hey, I'm joining in on the blog hop. I love your cards. You have a great style. The New Years Card is great. Love them both!! She looks ready to party! Love your cards especially the New Year's card. Thanks for a chance to win.